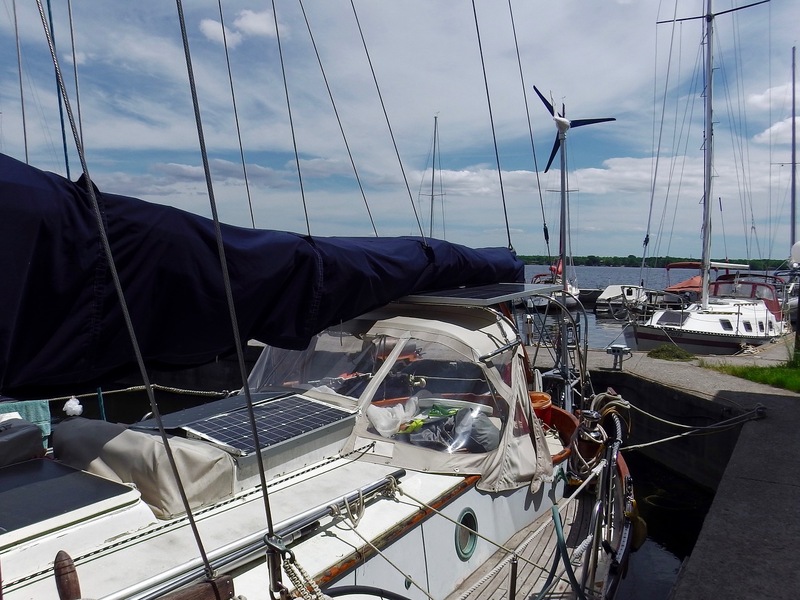 Show multiple photos of solar panel installations on boats (sail or power) along with some descriptive text to identify the type of installation, location, effectiveness, and costs and benefits of the products chosen. This thread is intended to show or illustrate how solar is being installed on a wide variety of boats. Small or large or very large solar installations are encouraged to be shown. Please provide multiple photos of your Solar Panel installation on your boat, if you have them. Please include a photo that shows a profile view (or wide shot) of the boat so that the installation can be seen to show the location and how the appearance of the boat is affected. Do you have more info about your installation on a blog? If you have a blog post that shows more details of your installation, post a link to that post. But, please post some photos and answers here, not just a link. There are many previous threads on CF that discuss various aspects of Solar power on boats. But, most do not include any or many photos that illustrate how those panels are installed and how that may affect the panel efficiency or the ease of use of the boat. Or how the boat looks after installing a lot of solar panels. My hope is that this thread will be populated by many photos (and text answering the questions up above) from many different boats. I believe that "Pictures tell a story" and they can be informative and inspirational and helpful. You might want to cover controller type and whether wired parallel or series. There was a thread on here a while ago where testing was done and, IIRC, parallel or series didn't seem to make a big difference to shading losses. I'm heading out to the cockpit for a coffee, I'll take a couple snaps. But a tour boat just pulled in with some really small bikinis heading for the beach, so I'm not going to have time for all of those questions. Boat's a PSC Orion 27. Bimini frame holding up two Renogy Eclipse 100w panels which provide a little shade in the cockpit. Panels are mounted with simple SS u-bolts. Feeds a Sunsaver duo pwm controller set to send 80% charge to house bank, and 20% to starter battery. I have very low power demands, biggest being the fridge/freezer and the tiller pilot. Foot pumps for water and LEDs. Tiller pilot, radar, AIS, chart plotter, and charging for tablet's and phones is easily fed with this system. The one place I'm working on; if I remove the compressor for the fridge I'll have enough room for two more Trojans, which would give me enough reserve to use the fridge full time, but no fridge. As it is now, I only turn it on when motoring, tied to the dock or when I won't be out for more than a few days. The last of which never seems to happen. Now, back to the task at hand. Oh wait, it's after noon, time to ditch the coffee and have a luke warm one. Great thread! Something that would add to the thread is how much your panels produce on average. This "real world" information is very helpful to those who are installing a solar system. I'm about to upgrade my 90w of solar with a big 265w/30v panel. I'll have a total of 355w of solar and my consumption is about 50ah a day. I'm hoping this will cover my needs and then some. Speaking for my setup, I didn’t pay detailed attention to AH-in for solar vs wind. It was all tied together through the same controller, which is something I will change for the coming season. But I would routinely see our solar system generating mid to upper teen amps, for hours at a time. Occasionally I’d see mid-20s, but that was rare. As you can see from our setup, it is hard to have all panels exposed at one time. Only at anchor, and only when swinging to the south, could we reliably expose all panels. This is why I went with a parallel arrangement. Much of the time at least 1/2 the panels are shaded in some way. Partial shading is a real killer. Amazing how little it takes to knock the amps way down. Added to this is the fact that we’re in Canada, so sun exposure ain’t what you’d see down south. Thank you Steady for such a good thread idea, I will be watching with interest as our installation is mostly temporary and a bit under capacity at the moment. 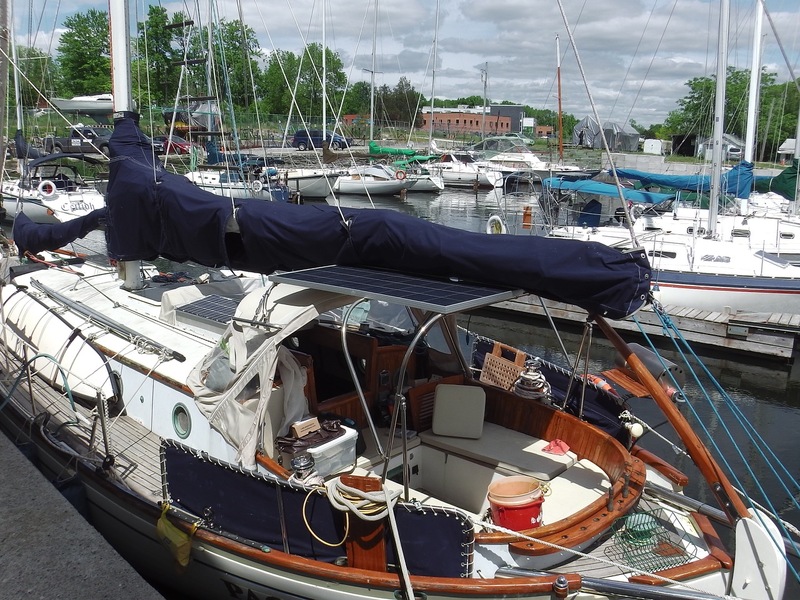 We have a Swanson 42, canoe stern, which adds some challenges. The stainless steel framework for the panels came with the boat but the 20+ year old panels on the frame were both degraded and very small by today's standards, with a pair of 80 watt panels, producing maybe 50 watts each at best. (Tested on shore, clear of shade and with perfect alignment, sold them on ebay with the old regulator.) Two 60 watt panels on the deck house roof were producing 20 watts between them so went in the bin. Currently we have two no-name 140 watt panels from Ebay, installed about 18 months back. Very cheap, about AU$120 each. Chosen more for their physical dimensions than anything else at around 900 mm x 1300 mm but also chosen to be temporary as the boat is a dock queen. Best output I have observed from the pair is 210 watts. Shading from the wind generator is a problem, as is a slight chance of shading from the radar. Also the rear stay always shades one panel to some extent. Not much I can do about the shading (I am firmly of the belief that wind generators are still useful to have) so the intention is simply to replace the existing no-name panels with something decent and add more panels when we are ready to set sail. My preference will be to install these on the bimini frame which is surprisingly strong (I can swing from it and I'm not light), I'd rather keep the deckhouse roof clear for sail handling activities. Between the bimini and the existing frame it should be possible to install around 600 watts very easily, maybe 800 watts if I got lucky with panel sizes. But the bimini panels would be very vulnerable to shading. One very interesting bit of damage when a big storm threw something very hard and heavy at the boat, hitting the upwind panel and ripping two of the mounting bolts through the panel frame on that corner, shattering the glass on the panel and bending one of the wind generator blades. Impressive given the panels sit 3.4 meters above the water and there is no land upwind of where we were moored at the time. I have made a temporary repair by covering the panel glass with casting resin. This is keeping the water out but I suspect that panel has lost a good 30% output, or more. Side benefit of the installation is the excellent shade over the seat at the stern of the boat. Just noted the bit about average output. Hard to tell because the boat is a dock queen, but from my limited weekending I would say about 50 amp hours in fair conditions. This last few days it has been overcast and raining and I got all my power from the wind generator, even at anchor, with the wind generator producing 60 amp hours in the one 24 hour period at anchor. At the same time the most I saw from the panels was 4.3 amps in the middle of the day. 59.3"L X 21.3"W X 0.2"H / 11.3 pounds each. Purchased a few months ago. Solara (S560M43) 140w Power-M semi flexible solar panel with SunPower cells and optional EZ Mount Frame Kit. Purchased from Coastal Climate Control. This is a marine grade panel. The reason I broke the bank on these was due to the high efficency ratings. I wanted to make sure I could squeeze out every last watt from the square fottage that I had available. I would purchase proper tinned 10awg wire. The stuff Coastal Climate Control offered as the "ultimate solution" was terrible. No problems, dissapointments or surprises. I am perfectly satisfied and I am yet to experience any weakness of my system. It's made it so much more comfortable to liveaboard without having to worry about power. I leave the inverter on full time, i dont worry about turning off lights because I generally produce more power than I need. I am planning to add a D400 wind generator when I can afford a watermaker. I like your design. Did you bend the tubing yourself or did you have it fabricated? I ordered a Bimini the size I needed, and just didn't use the fabric. I think I ordered from sailboatowners store website. Downside; they use 304 stainless, but I just wanted to try to see if it worked. I can always use this to get 316 tubes bent up if rust becomes an issue. So far no down side. I was actually waiting for someone to come out with this size panel for the last two years, so I jumped on them right away when they came out. It makes a big difference. If there is any shading you do not want series. Mine was a very simple job, for a weekender boat. It's a 100w panel, using a couple of Sea Dog rail clamps mounted to it, so that it could be easily removed. The support poles are a couple of adjustable bimini poles, that work perfectly, which give plenty of up/down adjustment. This picture, I hadn't yet re-tied the cabling down, but normally there are zip ties holding it to the rails. Approx 2' x 3 1/2' in size. Panel just completed their third year aboard the boat. Only seasonal though, so it's stored through winter. Zero issues for location, which is why I chose that spot. I guess I could angle it and turn it into a Honda spoiler for faster sailing? I paid approx $180 shipped, if memory serves. The rail clamps were about $20ish, and the poles were about $70. So all in all, a tad under $275 as it sat. I have very little shading on it most of the time, and for what little draw I had in the boat, it always topped me up extremely quickly. None, actually. The only issue I had was that my rail clamps didn't have an adapter for the size of my railing, but just overlapping the rubber ring for a larger rail size, it worked fine. No wind issues, and the stainless poles never showed signs of wear. For what it's purpose was, it was perfect. For salt water, or longer cruising, I might go name-brand, but I never had an issue. As above, had no issues. The controller worked fine, and the only problem was self-inflicted when I pulled a wire loose and didn't notice until my plotter gave me a low voltage message. Considering the use was for a weekend sailboat, it did a few things. I had two GC2 batteries, so I had plenty of amps for the LED lights on board, and then some. But what it enabled me to do was to have zero worry about bringing a small TV on board, or running my laptop, charging phones, or anything like that. I knew that I had the capacity to use, but also the capacity to replace what I used. It would've taken a LOT more than I would've ever used, to tax the system, which is exactly why I went with a 100w panel, and not a smaller one. I wanted overkill, versus uncertainty. Some thoughts re my install.... fitted in Cyprus in about 1992.... Australian made Solarex ( which later became BP Solar ). How big? Dunno offhand but if trimmed to optimum in good sunlight the pair put out between 4 and 5 amps... some times a bit more but that is rare. Set up when I bought the boat was a bit ordinary but similar to what I have now. They are good as tension/tightness/call it what you may on the tube can be adjusted for optimum so the panel stays oriented as you want but can be adjust easily by hand or foot. Thats about it really... no way will I have an arch down the back. As fitted can be trimmed every few hours if needed... typically when heading northish or southish.... or just trimmed for 'noon' and ignored if east or west. And also.... not shaded by the boom/mainsail in the normal course of events.